Chronic deficiency of kidney qi and yang causing lower back pain or weakness, weak knees, coldness in the lumbar region or legs and urinary dysfunction. Also for yang deficiency causing male impotence, female infertility, coldness in the limbs or edema. Polyuria due to diabetes, pressure of the fetus during pregnancy, toxemia during pregnancy, chronic nephritis, chronic prostatitis and yang deficiency lupus. 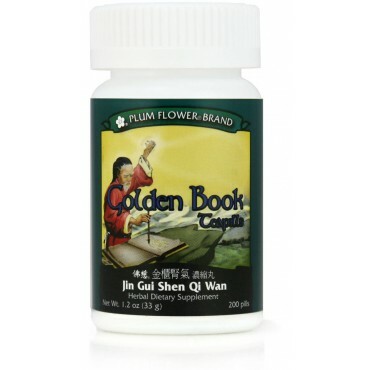 As a geriatric tonic are some of the imbalances satisfied clients have used this product for. Rehmannia glutinosa root-prep, Dioscorea opposita rhizome, Cornus officinalis fruit, Paeonia suffruticosa root-bark, Poria cocos fungus, Alisma plantago aquatica rhizome, Cinnamomum cassia bark, Aconitum carmichaeli root-prep. - Shu di huang, Shan yao, Shan zhu yu, Mu dan pi, Fu ling, Ze xie, Rou gui, Fu zi.